When it comes to cookies, I’m always looking for something new and delicious. The last cookie recipe that I threw together was the Oreo Chunk Cookies, soft sugar cookies packed with Oreo chunks and topped with Oreo crumbs. Those were a big hit. 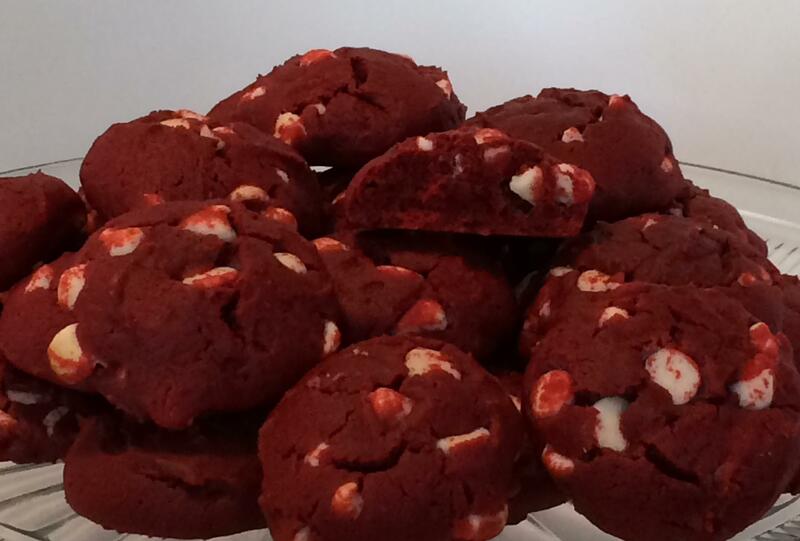 Soon after the last cookies, I came across a recipe for red velvet cookies, and my jaw dropped. Since so many people I know absolutely love red velvet, the ability to resist making these cookies was thrown out the window. Sour cream in the cookies? Yes! It keeps them incredibly moist. Personally, I’m not a fan of the flat, crispy cookies (unless they’re shortbread), so my cookies tend to be thick and fluffy. These were fabulous. Oh, and if you look at the recipe and say, “There can’t really be that much food coloring,” but it is. In cakes and cupcakes, I can usually decrease the amount of food coloring since the other ingredients don’t add a whole lot of color, but the melted chocolate is a big portion of the original color of these cookies. These cookies are a little rich, but absolutely delicious. Preheat oven to 375 degrees. In a microwave, melt unsweetened chocolate, stir until smooth, and cool. In a large bowl, cream butter and sugars until light and fluffy. Beat in the egg, food coloring and vanilla. Add cooled chocolate, beat until blended. In another bowl, mix the flour, baking soda and salt, add to creamed mixture alternately with sour cream, beating well after each addition. Stir in white chocolate chips. Using cookie scoop, drop two inches apart on parchment paper lined baking sheets or baking stone. Bake for 9-10 minutes, or until set. Remove to wire racks to cool completely.